I have bad popcorn karma, or, more specificially, bad microwave popcorn karma. When I make microwave popcorn, 25% of the time the bag catches fire. This happens for many reasons, the main one being that I, up until a few months ago, refused to use the handy popcorn button on the microwave. I’ve burned so much popcorn, I have been banned from making it at work without supervision (in other words, if I want popcorn at work, someone else has to make it for me). I’m pretty sure if I can’t get this popcorn issue under control, I’ll soon be banned from making microwave popcorn at home. Tonight, I threw a bag of microwave popcorn in, hit the magic popcorn timing button, and started talking to Jene’. Then I smelled the smoke. 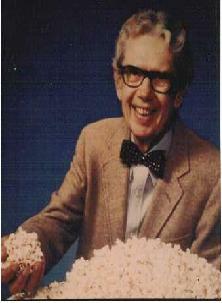 I cannot seem to get the spirit of Orville Redenbacher to help me with this problem. Turns out I had thrown in a mini bag of microwave popcorn and pushed the button for a bag twice it’s size. Hence the smoke. I put out the smoldering remains of my popcorn in the sink, apologized for the smoke and sprayed odor eliminating spray throughout the apartment. Then I threw a large bag of popcorn in the microwave and pushed the appropriate button. Nothing burned. My unburned popcorn is now finished… and hopefully the smoky air will dissipate before I go to bed. isnt this the second time this has happened recently?? ?hhmmm….